EVE is a living breathing entity to itself. With pilots actively living in the game with its wide range of worlds and cultures. Capsuleers very in many aspect from pod to pod, but there is one common aspect we all follow, “honoring our fallen brothers and sisters.” Pilots are actively living life both in and out of New Eden. Spanning 15 years, the community has experienced loss, including the sadness of having someone passed away. For many, the passing of each pilot touches us. As their lives and ventures made an impact to the game. Even the after-effects of pilots can be felt. More than leading a roam, building a ship, have lasting effects. A simple lesson they taught or joke they shared, are often more impactful and longer lasting. There are countless stories, it is hard to keep track of them all. We are seldom reminded about these passing’s by the lone pilot in space lighting a cyno for their fallen friend, family, or loved one. Round pilots up for a memorial roams in honor of their passing. As a pilot of CVA, we fought a roaming fleet from The Watchmen/Tactical Supremacy that went into our territory, a prized fit Paladin leading the charge. While both forces fought to the end we, CVA were victorious. Later we learned the reasoning behind the fleet, to honor a pilot that had passed on due to cancer. The Watchman were formerly part of Providence. There is some contention behind The Watchman leaving. Both sides harbored long griefs and grudges over the years due to this. The Paladin was the prized possession of the Member of The Watchmen, the member who passed away. His name was Ragnar Loathbrook. Like his name, he was a real life Viking standing almost 7 feet tall with blond hair and blue eyes. He was loyal to the old gods and avid gamer. Felix Legion, his Corporation wanted to give him a proper Viking Burial in the game. (Vikings traditionally would be set afloat on their longboats and it be set aflame for a funeral.) He was a joy to have in fleets according to many of his former FCs and so loved flying Paladins, he would bring them even to Frigate fleets. So Ragnar’s Paladins mission was to go right to the Providence Keepstar and shoot it. Mekwell FC-ed the fleet. Asha one of Ragnar’s dear friends took time to organize the fleet for Felix Legion. This was not going to be a returning mission. His friends ships were renamed to famous names of Valkyries. His ship was renamed to Ragnar’s Longship. An Athanor was also renamed Ragnar’s Longhouse in his honor. Well good reader I don’t know about you, but the breath was caught with every single one of the Provi-Bloc pilots in that fleet. Comms were silent in respect for The Watchmans Fleet. In that moment, the past aggrieved issues seemed so small and so pointless. The honor of a fellow pilot was all that mattered. A member of our community. That moment changed my perspective on The Watchmen. Sometimes events like this can bring even the most heated enemies together in real life. I was astonished at one pilot’s efforts to give memorials to all pilots that pass away in EVE Online. In real life his name is Charles White, in game he plays as Max Singularity the Pope of New Eden. The players of EVE Online recognized his mission for this and have given him the title of Pope. For that is for another story to tell. This one is how one man continues to honor our Pilots with his mission here. I first ran into Max in full custom in Eve Vegas. People lined up and asked his blessing or his opinion on this topic or that. I was instantly struck by his aura that seems to radiate friendliness. His eyes seemed heavy in wisdom and seemed the quintessential grandfather figure that seems to slip wisdoms into simple conversations or lessons. While he is an elderly gentlemen his jovial spring in his step and energy would put him close to a youth. He started doing memorials about two years ago when one of his friends had an ongoing forum post of fallen pilots. Then during Eve Fest in Iceland, he would take and light a candle in Iceland at the Eve Monument to honor the pilot. A picture would be taken and the photo would be put into the forum for others to see and track. For a while they created a website just to track and honor all pilots, families, friends, and loved ones that have passed away. Max had stories about the players and information about them. It turned out to be a lot of work for him and supporters. As the player base was active, but also passing away. It was almost too much to sustain. However, the internet being some what frail the servers crashed and they were unable to retrieve much data. Max coming to the conclusion it was almost impossible to continue, settled with having a memorial service in Iceland on Sunday, the last day of EVE Fest. Those usually in attendance do so to honor their friends and loved ones. It usually draws around 30 people. What is interesting is how this has also changed me. I am just a player, but people started coming to me and ask me for a blessing. It is one thing for me to bless a person, but it is another when someone comes up to me and asks me to bless their newborn child or family. I thought “wow” how do I do that? Not just this but also to bless the departed pilots as well. Even pilots have asked him to bless their departed father or mother. So I had to look at myself. I had to wonder what is a blessing? Is it something I have school for? Is it something I need to be certified for or get a document or paper? Do I have to get someone else to approve me to bless someone? I took some time and went into the mountains and pondered this. I had to give this whole “Space Pope” a thought. I came to the conclusion that we ALL have the power to bless each other and we should. We all have that ability and that’s what changed me. So when someone says “will you bless me,” I say “yes.” I will bless you or I will bless your child. When I do so it does make me stop and it makes me think and choose the right words very carefully, because words have power. They have the power harm. That is where verbal abuse comes from. They also have the power to heal just as these words can affect you and I. That is the power of blessings and the power of words. I have that power just as you have that power. We all have that power if we wield it carefully and reverently. You don’t need to have anything other than that faith in your words. 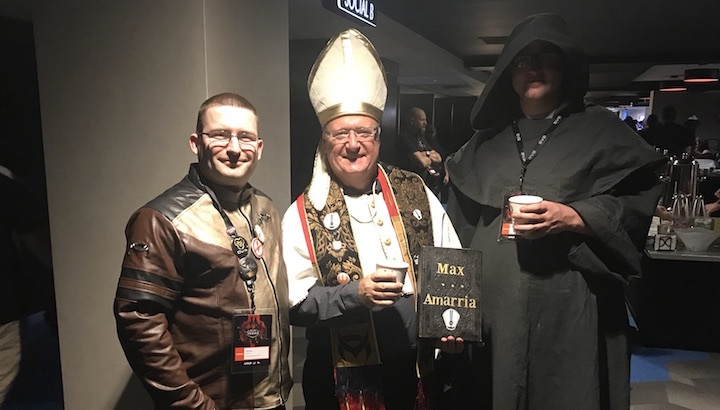 There is many stories out there about how I became the Space Pope. That I really had no choice the players did it. However, it did take a real hard decision for me to take on that mantel. It took an even bigger choice to take it seriously. I could of done both decisions flippantly. I took it to heart. I got dressed up and I put myself out there. Yea it is a brand however, it is an honor. It is an honor to fulfill the role. It is an honor to do the memorials. I have done weddings. People have asked me to travel to different countries as part of the Space Pope. So I have gone to Norway, Finland, Germany, and most importantly under no banner of no religion. I travel and don’t mention anything about god. I talk about our responsibility and our respect for each other and our community. There is more that unites us than divides us. I see the world environment now. I see many people that are forgetting that. Inclusion is the philosophy of love. Exclusion is the pillar of hate. In conclusion, after walking away from the encounter with Max, I felt deeply humbled. His wisdoms and simple manner in which he held himself was awe inspiring. My wife and I both felt blessed to have met one of the many amazing people in our community. This is truly what makes this game great. This article is dedicated to the memory of Ragnar Loathbrook and all those we have come to know and lost, till Valhalla my friends. We shall meet again. I simply want to tell you that I am just beginner to weblog and definitely enjoyed your blog site. Most likely I’m going to bookmark your site . You absolutely have awesome posts. Thanks for revealing your web site. Simply how does one earn money from blog sites? How does one beginning it or deal with it? Exists a details method to do it? Simply exactly how does one generate income from blogs to begin with? Where does one begin in this? Do you have to promote and use your charge card? Exist any particular sort of policies you have to adhere to? Do you need to set the blog up on your own or exist ones that assist you set up it up? Exactly how do you obtain marketers on your blog site? Are individuals minimal to the variety of blogs online? Exactly how typically do you make money?. Thanks for the help!. fTcDNi Just that is necessary. I know, that together we can come to a right answer.